A new walking seminar explores the life and work of Sigmund Freud, through his complex and fascinating relationship with the city of Vienna. Context, organizer of critically acclaimed walking tours, expands its program in Vienna, with City of Dreams, Freud’s Vienna, a new walking tour that traces the life and work of Sigmund Freud and his relationship to Vienna. The founding father of psychoanalysis, Sigmund Freud spent most of his life in Vienna. His work in the field of psychotherapy remains highly influential, and today carries weight across a range of philosophies and disciplines. Such is the gravity of Freud’s legacy that Vienna has become known as the City of Dreams. City of Dreams, Freud’s Vienna explores the places Freud lived and worked, to discover how the Austrian capital inspired his work, and how, in turn, his presence influenced the city. Though a successful doctor with a loyal local following, Freud’s story took a dark turn in the 1930s as the Nazis came to power. As a Jew, he and his family faced increasing persecution and were finally forced to flee following the German occupation of Austria. As well as uncovering the charismatic psychoanalyst’s life, the tour takes an in-depth look at the wider socio-political upheaval that took place during Freud’s 47 years in Vienna. Led by a local scholar, City of Dreams, Freud’s Vienna, pays particular attention to the fate of Vienna’s Jewish community during World War II, and, in its aftermath, collective attempts at coming to terms with this difficult period of history. City of Dreams, Freud’s Vienna lasts three hours and is available daily. Group walks cost €70 per person. Private tours cost €305 per party. As with all Context walking seminars, groups are led by a credentialed expert and limited to six people maximum. Founded by National Geographic writer Paul Bennett and designer Lani Bevacqua, Context Travel is a network of English-speaking scholars and professionals, including art historians, writers, architects and gastronomes, who organize and lead walking seminars in twenty-three (23) world cities, including: Florence, Rome, Venice, Naples, Paris, London, Edinburgh, Madrid, Barcelona, Berlin, New York, Philadelphia, Boston, Washington, D.C., Istanbul, Athens, Beijing, Shanghai, Vienna, Prague, Budapest, Tokyo, and Kyoto. A certified B Corporation, Context Travel was named one of the fastest growing American companies in 2011 by Inc Magazine. Travel + Leisure has called Context one of the top European tour companies for its innovative approach to travel and the depth of its programs. To learn more about Context, visit its website at:www.contexttravel.com. Rabbi Barbara Aiello, a first-generation Italian-American who became Italy’s first female rabbi and the founder of the first active synagogue in Calabria in over 500 years, is organizing a Jewish Heritage Tour focusing on Italy’s deep south. The tour, ‘Southern Italy Through Jewish Eyes,’ is scheduled for October. Participants can choose either Part I — Calabria (Oct. 1-6), or Part II — Sicily (Oct. 5-10), or the full tour of both regions – 9 nights – Oct. 1 – 10. One true ‘first’ promised on this tour: a Ferramonti Symposium where survivors of that WW II Italian concentration camp will share their emotional stories of conditions and events of the period under Mussolini’s rule. Participants will learn first-hand the incredible story of how nearly 4,000 Jewish inmates were saved by Italian soldiers and villagers. A second ‘first’ will be the tour of the renovated and expanded synagogue, Ner Tamid del Sud, the first active synagogue in Calabria since Inquisition times, renovated by locals including Rabbi Barbara’s family. Rabbi Barbara, as she likes to be known, describes herself as ‘a rabbi in two worlds.’ She divides her time between her congregation and a senior adult community in Sarasota, Florida, and officiating at Jewish life cycle events in Calabria. She has also worked in Milan and travels across Italy as a spokesperson for modern, pluralistic Judaism. She has officiated at more than 50 Bar and Bat Mitzvah ceremonies for families from the US, Great Britain, Australia and Asia at Calabria’s newly restored synagogue. Rabbi Barbara’s father grew up in Calabria, her mother’s family hails from Sicily and the former Yugoslavia. She traces her roots to when her ancestors were expelled from Sicily during the 16th century Inquisition. Others who will be attracted to the trip are Italian-Americans, many of whom have ancestors who emigrated from Sicily and Calabria, regions that once boasted a 50% Jewish population. While the Jewish community of Italy dates back at least to Roman times over 2,100 years ago, their fate changed based on the whims of emperors, popes, kings and dictators. Guest scholars will include Professor Enrico Tromba, first archaeologist for the Bova Marina excavation project, and Professor Vincenzo Villella, historian who wrote the account of the Jews of Calabria. The trip is recommended for people who can keep up with a busy schedule and a good deal of walking. It is open to anyone of college age and older. The tour is being coordinated by Ellen Paderson of Smiles and Miles Travel, who has worked with the rabbi on many Bar and Bat Mitzvahs in Italy and Laurie Weiss Howell of AmalfiLife tours who has organized several southern Italian tours with Rabbi Barbara. For more information, costs and or reservations, contact: Ellen Paderson, Travel Consultant, at ellen@smilesandmiles.comcastbiz.net / 508-238-4088 www.smilesandmilestravel.com or Laurie Weiss Howell, 347-240-1244 / www.AmalfiLife.com. Rabbi Aiello’s ‘The Radio Rabbi’ can be heard on Sundays at 8:30 a.m. on WLSS 930 AM in Sarasota. Click on Rabbi Barbara’s website, www.rabbibarbara.com to listen to a podcast of the radio program and to find out more about the tour. 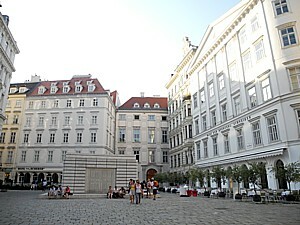 Vienna's Judenplatz, the historic Jewish Quarter from the middle ages, where there is the Jewish Museum, and the Holocaust Memorial. AMAWaterways has introduced a 2012 series of Danube River cruises oriented around Jewish Heritage © 2012 Karen Rubin/news-photos-features.com. From visiting the oldest synagogue in the world to touring Europe’s charming cities, AmaWaterways celebrates Jewish history with two of its most popular cruises: The Legendary Danube Jewish Heritage and Blue Danube Discovery Jewish Heritage. The themed cruises will journey across four countries on the Danube River on the AmaDolce, AmaLegro and AmaWaterways’ newest ship, the AmaCerto. The Legendary Danube Jewish Heritage– The 11-night itinerary starts with two nights in Prague, Czech Republic with a tour of Josefov, the former Jewish ghetto which is now the second largest Jewish museum in the world. Passengers will next enjoy a stop in Karlovy Vary, famous for its Bohemian Spas. Passengers travel to Nuremberg, Germany to embark on the Danube River onboard AmaWaterways’ newest ship: AmaCerto. In Nuremberg, passengers visit Zeppelin Field and view Hitler’s Party Rally grounds and Justice Palace where the war crimes tribunal sat in 1946. Passengers then cross the Continental Divide on their way to Regensburg to explore Germany’s best preserved medieval cities. The itinerary includes excursions to the oldest Jewish Ghetto in Germany; the Regensburg Synagogue; Jewish Cemetery “Judenau” and Oscar Shindler’s House. Passengers also visit Austria’s beautiful cities such as Passau, Linz, Melk and Vienna. The itinerary includes excursions to Salzburg, the setting for “The Sound of Music,” and a Benedictine Abbey tour in Melk. In Vienna, travelers enjoy excursions to the Jewish Museum, Judenplatz; Sigmund Freud’s House; Jewish Cemetery and the Jewish Quarter in Vienna’s 2nd District. Also available is a Vienna city tour and an optional Mozart and Strauss concert. Ending in Budapest, Hungary, passengers explore old Buda and modern Pest which includes sightseeing stops at the Sankt Stephen Park where travelers visit the statues of Raoul Wellenberg and Gabor Sztehlo, both credited with saving thousands of Hungarian Jews during World War II. Other excursions include visits to the Jewish District, 1956 Hungarian Revolution Tour, and a visit to the Parliament building still bearing bullet holes from the Soviet intervention. Travelers will also visit the “House of Terror,” a feared location of the Hungarian secret police. North American travelers can book this special itinerary now with a U.S. departure date of July 22, 2012. Blue Danube Discovery Jewish Heritage – The 13-night itinerary starts with two nights in the beautiful and historical city of Budapest. Passengers explore Sankt Stephan Park and the Jewish District for a walking tour featuring stops at the Dohany St. Synagogue, the Old Jewish Cemetery and the Tree of Life. Passengers also visit the distinctive Fisherman’s Bastion, the Royal Palace, St. Stephen’s Basilica and the famous Heroes’ Square before embarking onboard the AmaDolce or AmaLegro. Cruising along the Danube River, passengers stop in Bratislava, Slovakia to visit the tomb of Chatam Sofer, Bratislava’s most famous Rabbi. Passengers can take a walking tour of Bratislava to visit landmarks such as the Old Town Hall, Mirbach Palace and the Gothic St. Martin’s Cathedral. Other shore excursions include the Bratislava Communist Tour to discover bizarre architecture of the “Slovensky Rozhlas” (Slovak Radio;) a visit to Liberty Square; visit to the memorial and cemetery for fallen soldiers of the Russian Army that helped liberate the city during World War II. Traveling form Slovakia to Austria, passengers stop in Vienna, the country’s capital. Excursions include visits to the Jewish Museum, Judenplatz, Sigmund Freud’s House, the Jewish Cemetery and Jewish Quarter in Vienna’s second district. Additional stops in the itinerary include Melk, Linz and Salzburg, the setting for the “Sound of Music;” Regensburg, home to Oscar Schindler’s House; Nuremberg, where passengers visit Zeppelin Field to view Hitler’s Party Rally grounds and Justice Palace where the war crimes tribunal sat in 1946. The itinerary ends with two nights in Prague, Czech Republic with a tour of Josefov, the former Jewish ghetto. North American travelers can book this special itinerary now with U.S. departure dates of August 2, October 14 and October 25, 2012. AmaWaterways’ AmaCerto, AmaDolce and AmaLegro ships carry a maximum of 148-164 passengers that incorporates the most advanced river cruise ship design including Twin or French Balconies in the majority of its spacious staterooms and suites, which range up to 350 sq. feet. Passengers will enjoy gourmet dining with free-flowing local wine at the multiple fine dining venues available onboard. The ships also feature a sun deck; fitness center and spa; complimentary Internet and Infotainment system in all staterooms plus ship wide Wi-Fi. For passengers wanting to explore the serene paths along the rivers, the ships offer a fleet of bicycles onboard (capacity controlled). Other themed cruises available: Romantic Danube Wine Themed, The Legendary Danube Wine Themed, The Enchanting Rhine Wine Themed, Provence and Spain Wine Themed, Christmas Time Cruise and Christmas on the Rhine. For more information on AmaWaterways, visit www.amawaterways.com. To book, contact a local travel agent or visit www.amawaterways.com, like on Facebook and follow on Twitter. London, September 15, 2011 — Context Travel has launched a new walking seminar of London’s historic Jewish neighborhood, led by historians from its network of experts and scholars. The walk looks at the history of Jewish communities in London from 1066, when William the Conqueror encouraged Jewish merchants and artisans from northern France to move to England. Traversing the centuries to the still vibrant community of modern times, the walk is offered both privately on request and as a group walk every day of the week except Saturdays. Context’s Jewish London walk starts by Jewry Street, with a brief tutorial on the history and development of the area as the first port of call for Jewish families in 1066. Using maps and copies of documents, Context docents chronicle the development of the Sephardic and Ashkenazy communities in London and draw participants’ attention to visual clues to help them understand the social and economic context of the communities. The walk moves east includig such sites as the first purpose built Sephardi Synagogue in London, Bevis Marks. The itinerary continues touching on themes such as the importance of the rag trade (selling second hand clothes), and the role of “The Jewish welfare board,” established in the 19th cent. Visitors come away from the walk with a deeper understanding of how these communities developed and helped shape the history of London as we know it today. Jewish London is limited to 6 participants at a time. Group walks are priced at £60 per person, private walks are available at £250 per party. The walk is a the latest addition to the Jewish History and Heritage series offered by Context to travelers in Italy, Paris, New York, Berlin, Istanbul, and Madrid. and gastronomes, who organize and lead walking seminars in fifteen world cities, including: Florence, Rome, Venice, Naples, Paris, London, Madrid, Barcelona, Berlin, New York, Philadelphia, Boston, Washington, D.C., Istanbul, and Athens. Travel + Leisure has named Context one of the top European tour companies for its innovative approach to travel and the depth of its programs. A Conde Nast Traveler “Top Travel Specialist,” Context is listed on Inc magazine’s list of fastest growing companies in America. To learn more about Context, visit its website at: http://www.contexttravel.com.